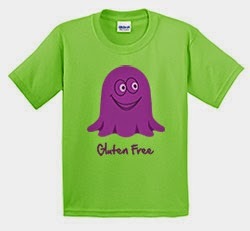 SensitiviTees prints colorful graphic apparel That Tells it Like it Is and Keeps it Fun with sensitivity messages; Gluten Free, Wheat Free, Milk Free, Dairy Free, Nut Free, Peanut Free & Food Allergies. Our whimsical artwork and colorful messages help others be more understanding about sensitive situations. My son is five and headed to Kindergarten this August. He was diagnosed with celiac disease (my husband and I both have it) around age 2. He's always been in group daycare centers where every precaution was taken with his food and diet. Now, as we look at entering public school, we have found out that we won't even know who his kindergarten teacher is until the night before school starts. I have filled out paperwork about his celiac disease for enrollment, but won't be able to talk to anyone in person until the night before school starts. This had me very concerned because I understand they hand out snacks regularly in the classroom and the kids have shared desks, etc. 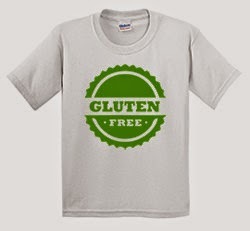 I started searching online for some cute t-shirts that said "gluten-free" to make it clear to any adult around him that first week of school that he is the child who has celiac disease. Most of the t-shirts I found were very confusing. They said things like "got gluten?" or had a weird picture of wheat that looked like we were endorsing it, not against it. Then I stumbled across the SensitiviTees website and found (finally!) shirts in his size that were very clear and easy to read. When we opened the package last night, he grinned from ear to ear. I asked him what the shirts said and he proudly announced "gluten-free!" I think the first week of school will go just fine! Thank you Jo, for your wonderful story. We are confident that the first day of school and other days to follow will come off without a hitch! SHOP NOW TO GET YOURS!!!!! !